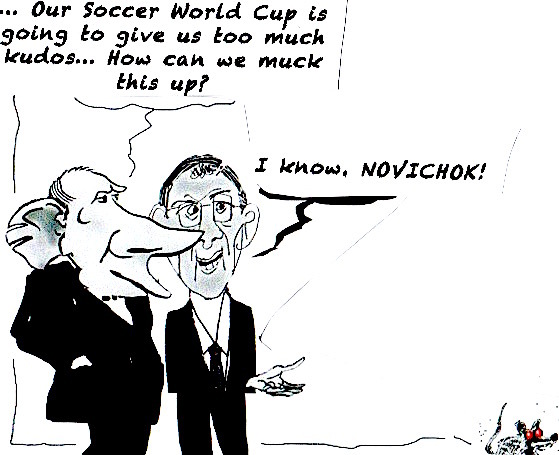 PUTIN: Our Soccer World Cup is going to give us too much kudos… How can we muck this up? L: Old Soviet poison prepared by your old Auntie Kay Geebee. P: Brilliant! Poland would be difficult, but England would be a piece of cake, no? L: Sure. I’ve heard of two guys we could use to do the deed. L: No. Total crap... They came last at spy school. Could not tie their shoe laces without being seen by CCTV. L: … and they have no clue on how to use underarm deodorant. They smell like “piss and Russian”. P: When can we start? L: A couple of months before the kick off. P: you sure these bumbling idiots can do poisoning without killing themselves? L: We'll give them fake poison in a perfume bottle. They will stay clear of the stuff. P: should we tell MI6 about these guys? P: Did you say bicycle clips? L: Sure. Our spies can’t even afford cars. They have to travel by train. P: How can a perfume simulate poisoning? P: So who are we targetting? L: Ol' Skripal… He’s Russian and he pissed on us before. As an anti-piss and Russian, that perfume will make him pass out. P: We’re devious, aren’t we? With fewer than 1,000 inhabitants, it has rail access but no paved roads. It's too small even to show up on Google Maps. But Loyga has proved crucial to piecing together the story of the real "Alexander Petrov" - the second man the UK authorities suspect over the Skripal poisoning case in Salisbury. On Monday the Bellingcat online investigations team announced they had discovered Mr Petrov was actually Dr Alexander Mishkin, born in Loyga, in the Archangel region. So BBC Russian began trawling through Russian social media sites. They looked for people aged between 29 and 49 who were born in Loyga, and within two hours they had found four who all remembered Alexander Mishkin from their school days and recognised him from the photographs uncovered by Bellingcat and, crucially, from the UK official photo of the Skripal suspect "Petrov". 1. We haven't seen any photographs or heard anything from Sergei Skripal since 4th March. The last confirmed images we have of Skripal is CCTV footage of him in a shop in Salisbury at 12.47pm on 27th February. We haven't seen Yulia Skripal, Sergei's daughter since a short video statement featuring her was released on 23rd May. 2. Investigative website Bellingcat contends that the two suspects identified by the police, and traveling under the names Ruslan Boshirov and Alexander Petrov, are in fact Anatoliy Chepiga, a highly decorated colonel from Russian military intelligence, and Alexander Mishkin, a doctor working for Russian military intelligence. 3. We haven't seen any CCTV footage of the Skripal's house on 4th March, or of the Skripals on the bench where they were found at around 4.15pm. Obviously that story is not true, but it now appears that the mission assigned to the unwitting Russian couple was much more than simply to be caught on CCTV in the vicinity of the elusive Skripals, and that they were a pivotal part of “Operation Nina”– both in the planning stages and in the extended “action phase”, currently playing out in the media and institutions of the Western world. The researches of Elena Evdokimova, explained in systematic detail on her twitteraccount, allow us to turn what was previously just informed speculation into solid assertions which now look “highly likely” to be true, and which then become a basis for further well-informed speculation. I use the term “highly likely” with reservation, having previously argued that it lies a long way from certainty. In this context however, it’s only fair to adopt Mark Sedwill’s own interpretation of the phrase as meaning “100% certain”, bizarre as that is. MI6 boffins discovered that Skripal, far from being a reformed "double agent" working for them, was still a "double agent" working for Russia. The "switch-snitch" had been discovered as usual, when some exclusive information, only known by Skripal and his MI6 handlers ended up on the Russian secret services desk. MI6 operatives knew they had a problem, especially in regard to the task Skripal had been assigned to: investigate the Russian Mafia, which the Russian government also hates. Contrarily to the Jamal Khashoggi affair, IN WHICH THE SAUDI HAD A POWERFUL MOTIVE to get rid of him, Russia did not have a single motive to get rid of Skripal. He was still one of its assets. All this information is provided to you by the Gus Leonisky "Intelligence" Network without any proof. The Skripals have not been poisoned but "spirited away" as not to communicate to any Russian personnel ever after. Think about it. 1. National intelligence agencies have long played major roles, often not entirely visible, in international politics. They are doing so again today, as is evident in several countries, from Russiagate in the United States and the murky Skripal assassination attempt in the UK to the apparent murder of Jamal Khashoggi in the Saudi consulate in Turkey. Leaving aside what President Obama knew about Russiagate allegations against Donald Trump and when he knew it, the question arises as to whether these operations were ordered by President Putin and Crown Prince Mohammed bin Salman (MBS) or were “rogue” operations unknown in advance by the leaders and perhaps even directed against them. There have been plenty of purely criminal and commercial “rogue” operations by intelligence agents in history, but also “rogue” ones that were purposefully political. We know, for example, that both Soviet and US intelligence agencies—or groups of agents—tried to disrupt the Eisenhower-Khrushchev détente of the late 1950s and early 1960s, and that some intelligence players tried to stop Khrushchev’s formal recognition of West Germany, also in the early 1960s. It is reasonable to ask, therefore, whether the attacks on Skripal and Khashoggi were “rogue” operations undertaken by political opponents of the leaders’ policies at home or abroad, with the help of one or another intelligence agency or agents. Motive is a—perhaps the—crucial question. Why would Putin order such an operation in the UK at the very moment when his government had undertaken a major Western public-relations campaign in connection with the upcoming World Cup championship in Russia? And why would MBS risk a Khashoggi scandal as he was assiduously promoting his image abroad as an enlightened reform-minded Saudi leader? 2. We do know, however, that there has been fierce opposition in the US political-media establishment to President Trump’s policy of “cooperating with Russia,” including in US intelligence agencies, particularly the CIA and FBI—and at high levels of his own administration. We might consider Nikki Haley’s resignation as UN ambassador in this light. Despite the laurels heaped on her by anti-Trump media, and by Trump himself at their happy-hour farewell in the White House, Haley was not widely admired by her UN colleagues. When appointed for political reasons by Trump, she had no foreign-policy credentials or any expert knowledge of other countries or of international relations generally. Judging by her performance as ambassador, nor did she acquire much on the job, almost always reading even short comments from prepared texts. More to the point, Haley’s statements regarding Russia at the UN were, more often than not, dissimilar from Trump’s—indeed, implicitly in opposition to Trump’s. (She did nothing, for example, to offset charges in Washington that Trump’s summit meeting with Putin in Helsinki, in July, had been “treasonous.”) Who wrote these statements for her, which were very similar to statements regarding Russia that have been issued by US intelligence agencies since early 2017? It is hard to imagine that Trump was unhappy to see her go, and easier to imagine him pushing her toward the exit. A president needs a loyalist as secretary of state and at the UN. Haley’s pandering remarks at the White House about Trump’s family suggests some deal had been made to ease her out, with non-recrimination promises made on both sides. We will see if opponents of Trump’s Russia policy can put another spokesperson at the UN. As to which aspects of US foreign policy Trump actually controls, we might ask more urgently if he authorized, or was fully informed about, the joint US-NATO-Ukraine military air exercises that got under way over Ukraine, abutting Russia, on October 8. Moscow regards these exercises as a major “provocation,” and not unreasonably. Congressional sanctions—for exactly what is not always clear—have helped Putin in another way. For years, he has unsuccessfully tried to get “oligarchs” to repatriate their wealth abroad. US sanctions on various “oligarchs” have persuaded them and others to begin to do so, perhaps bringing back home as much as $90 billion already in 2018. If nothing else, these new budgetary cash flows help Putin deal with his declining popularity at home—he still has an approval rating well above 60 percent—due to the Kremlin’s decision to raise the pension age for men and women, from 60 to 65 and from 55 to 60 respectively. The Kremlin can use the additional revenue to increase the value of pensions, supplement them with other social benefits, or to enact the age change over a longer period of time. It appears that Congress, particularly the Senate, has no Russia policy other than sanctions. It might think hard about finding alternatives. One way to start would be with real “hearings” in place of the ritualistic affirmation of orthodox policy by “experts” that has long been its practice. There are more than a few actual specialists out there who think different approaches to Moscow are long overdue. Will any of the US political figures already jockeying for the Democratic presidential nomination in 2020 take these realities into account? Russia’s meddling in the United States’ elections is not a hoax. A three-part video series from Opinion. Please note that "fake news" was invented A LONG TIME AGO... in BC times... A lot of "fake news" was used by the Israelites to maintain their status of superior "victims". So instead of critical understanding of – say – the Carbon cycle or astronomy, we have the denial of catastrophic climate change and the mythology of hyper-temporal space travel. A recent report that a new planet had been discovered, whose “proximity to Australia” made it of special interest illustrates this cognitive disjunction. At only six light years from Earth it is close in astronomical terms – but still about 6000 times the distance to the Sun. What other conclusion can we draw than this: that Yulia and Sergei Skripal were given some “special treatment” by Porton Down experts that kept them in a comauntil it was expedient for them to “recover”? Hacking syndicate Anonymous has just released its fourth tranche of documents hacked from the internal servers of the Institute for Statecraft and its subsidiary, the Integrity Initiative. Several explosive files raise serious questions about the shadowy British state and NATO-funded ‘think tank’ and its connections with the Skripal affair. The files were released just after 2:30pm GMT on January 4 — I've barely scratched the surface of the content, but what I've seen so far contains a panoply of bombshell revelations — to say the least, the organization(s) now have serious questions to answer about what role they played in the poisoning of Sergei Skripal in March, and its aftermath both nationally and internationally. One file apparently dating to "early 2015" — "Russian Federation Sanctions" — written by the Institute's Victor Madeira outlines "potential levers" to achieve Russian "behaviour change", "peace with Ukraine", "return [of] Crimea", "regime change" or "other?". The suggested "levers" span almost every conceivable area, including "civil society", "sports", "finance" and "technology". In the section marked "intelligence", Madeira suggests simultaneously expelling "every RF [Russian Federation] intelligence officer and air/defense/naval attache from as many countries as possible". In parentheses, it references 'Operation Foot', the expulsion of over 1000 Soviet officials from the UK in September 1971, the largest expulsion of intelligence officials by any government in history. The section on sports also suggests "advocating the view [Russia] is unworthy of hosting [sporting] events" — and the section marked "information" recommends the sanctioning of 'Russian' media "in West for not complying with regulators' standards". In April that year, Institute for Statecraft chief Chris Donnelly was promoted to Honorary Colonel of SGMI (Specialist Group Military Intelligence), and in October he met with General Sir Richard Barrons. Notes from the meeting don't make clear who said what, but one despaired that "if no catastrophe happens to wake people up and demand a response, then we need to find a way to get the core of government to realise the problem and take it out of the political space." "We will need to impose changes over the heads of vested interests. We did this in the 1930s. My conclusion is it is we who must either generate the debate or wait for something dreadful to happen to shock us into action. We must generate an independent debate outside government. We need to ask when and how do we start to put all this right? Do we have the national capabilities [and/or] capacities to fix it? If so, how do we improve our harnessing of resources to do it? We need this debate now. There is not a moment to be lost," they said. On 4 March 2018, former Russian military officer and double agent for MI6 Sergei Skripal and his daughter Yulia were poisoned in Salisbury, England. Within days, the Institute had submitted a proposal to the Foreign & Commonwealth Office, "to study social media activity in respect of the events that took place, how news spread and evaluate how the incident is being perceived" in a number of countries. The bid was accepted, and the Initiative's 'Operation Iris' was launched. Under its auspices, the Institute employed 'global investigative solutions' firm Harod Associates to analyze social media activity related to Skripal the world over. It also conducted media monitoring of its own, with Institute 'research fellow' Simon Bracey-Lane producing regular 'roundups' of media coverage overseas, based on insights submitted by individuals connected to the Initiative living in several countries. One submission, from an unnamed source in Moldova, says they "cannot firmly say" whether the country's media had its "own point of view" on the issue, or whether news organizations had taken "an obvious pro-Russian or pro-Western position", strongly suggesting these were key questions for the Initiative. Moreover though, there are clear indications the Institute sought to shape the news narrative on the attack — and indeed the UK government's response. One file dated March 11 appears to be a briefing document on the affair to date, with key messages bolded throughout. It opens by setting out "The Narrative" of the incident — namely "Russia has carried out yet another brutal attack, this time with a deadly nerve agent, on someone living in Britain". "Use of the nerve agent posed a threat to innocent British subjects, affecting 21 people and seriously affecting a police officer. This is not the first time such an attack has been carried out in the UK…14 deaths are believed to be attributable to the Kremlin…Russia has poisoned its enemies abroad on other occasions, most notably then-candidate for the Presidency of Ukraine, Viktor Yushchenko, in 2004. Russian political activist Vladimir Kara-Murza has been poisoned twice; and the journalist Anna Politkovskaya was also poisoned and later shot dead. Since Putin has been running Russia, the Kremlin has a history of poisoning its opponents in a gruesome way," the "narrative" reads. The file goes on to declare the British response has been "far too weak…it's essential the government makes a much stronger response this time" — and then lists "possible, realistic, first actions", including banning RT and Sputnik from operating in the UK, boycotting the 2018 World Cup, withdrawing the UK ambassador from Moscow and expelling the Russian ambassador to the UK, and refusing/revoking visas to leading Russians within Vladimir Putin's "circle", and their families. It's not clear who the document was distributed to — but it may have been given to journalists within the Initiative's UK 'cluster', if not others. 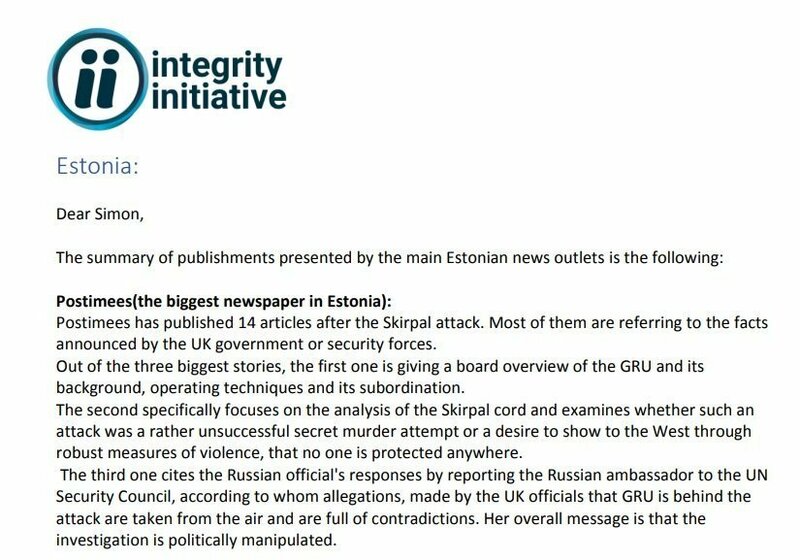 This may explain why the Institute's "narrative", and its various recommended "responses" utterly dominated mainstream media reporting of the affair for months afterwards, despite the glaring lack of evidence of Russian state involvement in the attack. It's extremely curious so many of the briefing document's recommendations almost exactly — if not exactly — echo several of the suggested "levers" outlined in the 2015 document. It's also somewhat troubling the "Global Operation Foot" spoken of in that file duly came to pass on March 28 2018, with over 20 countries expelling over 100 Russian diplomats. Likewise, it's striking Victor Madeira, the Institute staffer who made the recommendations in 2015, made many media appearances discussing the poisoning following the incident routinely documented by the Institute. Security consultant Dan Kaszeta also wrote a number of articles for the Integrity Initiative website about chemical weapons following the attack — including a July 14 article, How could Novichok have poisoned people four months after the Skripal attack?— receiving 40 pence per word. The Institute's bizarrely intimate connections with the incident don't end there. Another document apparently dating to July 2018 contains the contact details of Pablo Miller, Skripal's MI6 recruiter, handler and — unbelievably — neighbor in Salisbury. Anonymous claims the document is an invitee list for a meeting the Institute convened between a number of individuals and Syria's highly controversial White Helmets group, but this is yet to be verified. Whatever the truth of the matter, the latest document dump raises yet further questions about how and why it was BBC Diplomatic and Defense Editor Mark Urban — who was in the same tank regiment as Miller after leaving University — came to meet with Skripal in the year before his poisoning. When I attended the launch of his book on the affair in October — The Skripal Files — he was evasive on whether he played a role in connecting him with Skripal, and denied Miller was Skripal's recruiter. The latest trove also raises yet further questions about the activities of the Institute for Statecraft and Integrity Initiative. In light of these revelations, reading the record of Donnelly's meeting with General Barrons takes on an acutely chilling quality. It may be that purely serendipitously the pair got their "catastrophe", their "something dreadful", which "[woke] people up" and made the government "realise the problem" posed by Russia — or it could be they one way or another played a facilitative role of some kind. After months of refusing to answer the vast number of questions I and thousands of others have submitted to the paired organizations, it's high time for them to break cover, and be honest with the public. A third Russian agent implicated in the Salisbury nerve agent attack aborted his planned exit from the UK, raising the prospect he remained in the country. The Russian military intelligence officer - using the false name Sergey Fedotov - travelled to the UK on the same day as two hitmen who carried out the attempted assassination of Sergei Skripal. Two men identified as suspects in the attack, Alexander Petrov and Ruslan Boshirov, went on Russian state-funded TV in September last year to claim they had travelled to Salisbury as tourists, to visit its cathedral. Russia's Ministry for Foreign Affairs is seriously concerned about the state of health of former Russian intelligence officer Sergei Skripal and his daughter Yulia. The British side does not provide any information about Skripal's condition - Russian officials learn about his state of health only from news reports. "We have no information about the condition of either Sergey Skripal himself or his daughter Yulia. All our inquiries that we send to the British authorities remain unanswered," an employee of the Russian embassy in the UK said. According to 338 Telegram channel, the British authorities deceived Sergei and Yulia Skripal and can not free them now, because of the fear of their subsequent behaviour and public statements that they may make. As it was said in the channel, Yulia Skripal was given a petty post in British intelligence services for her agreement to take part in a campaign against Russia. However, the consequences of the incident significantly exceeded Yulia's expectations. British intelligence services can go to extreme measures to eliminate Sergei Skripal and his daughter to finally put an end to the case of their mysterious poisoning. It is worth mentioning that Sergei Skrypal's niece, Victoria Skripal, said that her uncle had already died. Reading more of this crap and you would think that Salon's article is as saintly truthful as the Bible. And it is. The Bible is a collection of fabricated stories used to bamboozle the masses into submission to the hierarchical oligarchs including the pope. Intelligence services investigated “increased” and “unusual” activity at the Russian embassy in London in the days before and after the Novichok poisoning, reports suggest. MI5, MI6 and GCHQ looked into “frantic comings and goings” at the building in Kensington in the days leading up to the poisoning of former Russian spy Sergei Skripal and his daughter Yulia in Salisbury on March 4 2018. In the wake of the deadly nerve agent attack the observations were “deemed to be significant and of interest”, it is understood. “The intelligence agencies have been investigating unusual and increased activity at the Russian embassy in Kensington in the days leading up to and after the attack on the Skripals,” a security source told the Press Association. Now, on the anniversary of that fateful and ever-mystifying day, I'll attempt to track some of the activities of the Initiative's parent, the Institute for Statecraft, and other key figures and organizations directly and indirectly connected to the body in the years immediately prior. Troublingly, the information collected here inevitably represents but a negligible fragment of a much wider clandestine picture. The full extent of the British state's sinister and long-running secret machinations leading up to the Salisbury incident certainly isn't ascertainable at this time, and may well never be. In July 2014, Institute for Statecraft ‘senior research fellow' Victor Madeira wrote an article for the organization's website, Russian Subversion — Haven't we been here before?. In it, he suggested that far from a "new type of warfare", the West's tussle with Russia in the wake of the Maidan coup was "actually only the latest chapter in a 100-year-old playbook the Bolsheviks called active measures", albeit "modernised to exploit the speed and reach of 21st-century mass/social media". After attempting to link various tactics employed by the Soviet Union to the modern day, Madeira somewhat chillingly concludes the piece with a quote from Ronald Lindsay, UK ambassador to Germany, who in February 1927 urged Whitehall to realise they were engaged in a "new kind of war" with the then-burgeoning Soviet Union. "Anti-subversive measures could not be gradual; they had to be part of a package of 'economic boycott, breach of diplomatic relations' as well as 'propaganda and counter-propaganda, pressure on neutrals.' He argued a diplomatic breach with Moscow would at least turn 'the present peculiar struggle into an armed conflict of the old-fashioned sort' that Great Britain and the West could win," Madeira records. A document authored by the academic — who 2010 — 2014 tutored and lectured at Cambridge under former MI6 chief Richard Dearlove — in January 2015 (Russian Federation Sanctions) makes clear he, and presumably his Institute employers, support Lindsay's strategy and aims. The file sets out a number of "potential levers" for achieving a number of "main aims", including "peace with Ukraine", the "return" of Crimea, "behaviour change" and/or "regime change" — for, much to Madeira's evident chagrin, the wave of sanctions imposed upon Russian individuals and businesses the previous March weren't having a sufficiently deleterious impact on the Kremlin, or the Russian people.